A crime novel you won’t soon forget,”Race into Murder,” is on sale for $.99. Jeff Frazier has a decision to make. Will he risk his marriage, or even his life, to follow a dream? After burglary and kidnapping hit close to home, Jeff and his wife wonder if their talented colt is the catalyst and if so, why? No one in the close-knit racing community is above suspicion following the murder of well-known jockey. When the homicide investigation points to an innocent man, his friends rally around him and try to point a finger at the real killer, even though none of them can agree on who it might be. Through it all the races continue. Does Bigfoot exist? Eli believes so. His story is told in ONE STEP AT A TIME. Two stories for free, and a ten story collection on sale for $.99! Join me between 12:30 and 1:00 p.m. on Wednesday, July 8th for a Sunshine Book Show party. 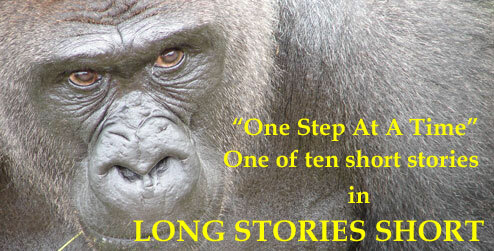 I’m delighted to be featured author and will be giving away a signed copy of LONG STORIES SHORT – maybe two or three! If you can’t make it to the party, you can still download the books. LONG STORIES SHORT, ten tales of suspense and supernatural, where you can usually expect the unexpected. If you have a minute or two, stop and say hello!